Since moving from a busy life in Chicago in 2011 with her husband, actor Jeremy van Meter, Catherine Glynn has been creating and performing in Lanesboro. Working as an executive coach and professional actress, Glynn, a native Minnesotan, has traveled extensively and made her living teaching and writing. Since arriving in Lanesboro, Glynn has been involved with Lanesboro Arts— it was one of her favorite places to shop. “Even from walking in the door to buy a piece of art and then, a few years ago, making the leap and asking if I could do “The Belle of Amherst” here. That’s when, artistically, things started to get more involved,” states Glynn. Glynn has performed in three shows at the St. Mane Theatre through Lanesboro Arts. The first, The Belle of Amherst by William Luce, was a show about Emily Dickinson that Glynn had performed as a senior in college. She wanted to expand her solo performance horizons and write her own play so she wouldn’t have to pay rights. Glynn was interested in the idea of doing a story about teachers, or artists, that then morphed into being teachers. She soon created Miss Myrna Davenport’s Poetry in Motion, a show based on all of the women in her family who are teachers. 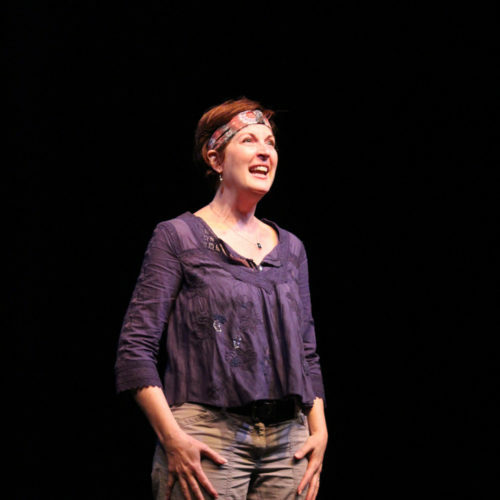 Her next show, “A.R.T.”— Audacious Raw Theater— was a natural evolution from doing solo shows. Glynn invited seven artists to spend seven days and create seven new works of art, all based on the theme of recreation or re-creation. “Lanesboro Arts kindly came in and gave us the home where we produced the piece. A magical union of a lot of great minds,” says Glynn. A.R.T. has been conceived as a multi-year initiative to foster the creation and development of new works, while serving as a performance art companion to the annual Art in the Park fine art festival. Glynn notes that Lanesboro Arts provided opportunities for her to creatively grow and explore through the St. Mane Theatre. “In those creative endeavors, Lanesboro Arts has wholeheartedly embraced me and given me permission to really fly. I think that’s what every artist needs. So to give me this beautiful nest from which I can move and fly and be free has been lovely,” she says.